Now that nicer weather is on the horizon, you can start making plans to spend more time in your own garden oasis. The first step to ensure your time outdoors is relaxing and enjoyable, is to make sure you have a place to go, and that relaxation place is a garden bench! An outdoor bench is great for enjoying the sunshine and flowers, reading a book, enjoying that nice cup of coffee, chit chatting with a friend, or even star gazing! Adding a garden bench or outdoor seating is a great way to transform an unused space into something unique and amazing, or perhaps just practical. Outdoor seating offers more space to entertain guests, steal away some precious quiet time, or a focal point in your landscape. 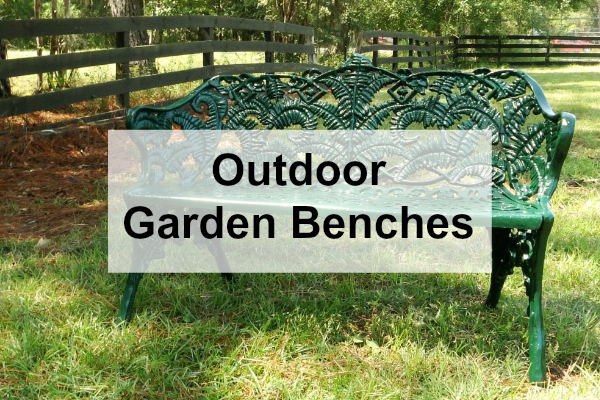 Today we are going to look at five outdoor garden benches that would make a great addition to any yard, especially yours! In one fell swoop you can add some vintage flair to your yard with our four-piece Victorian Patio Set. Made from modern no-rust aluminium casting and finished in high heat paint, this quaint ensemble is just what you need to bring you back to bygone days. Sit and relax while you turn the pages of “Pride & Prejudice”. Be sure to grab a pitcher of ice cold sweet tea or lemonade first! When your garden or patio needs something original, this high-back garden bench is for you. Our vintage design looks massive, but is made from special non-rust aluminium and weighs only 65 pounds! This piece also works well placed against a wall, in an atrium or lanai, or even a commercial setting such as an office plaza or executive park. Even executives sometimes need a place to sit and grab a breath of fresh air. Is your space petite or unique? Then we have just the chairs for you. These reproduction side chairs are perfect for placing under a tree, near a fountain, or can be added as sides to an existing bench. 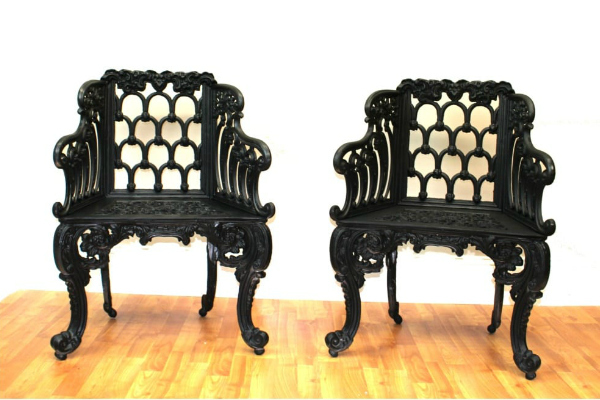 Claw feet and scroll work arms will draw attention to their formal appearance and add some grandeur to any setting. 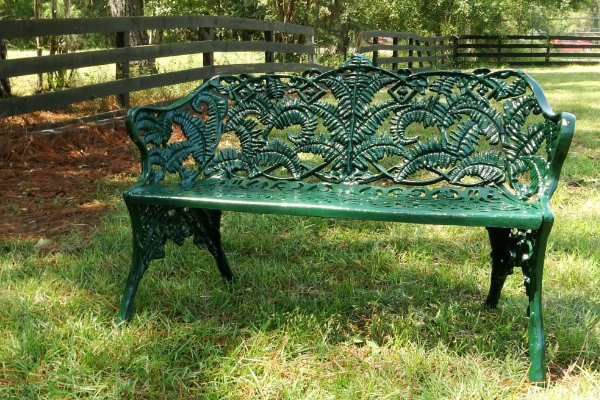 One of our personal favorites, (and available in hunter green or traditional black) this four foot long bench is as inviting as it is good looking. 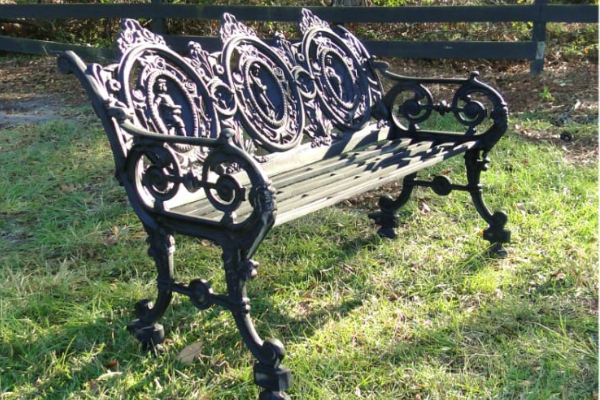 The quintessential garden seat, your neighbors will be envious! Built to withstand the rigors of being outside, the non-rust aluminum is solid feeling while still weighing less than 150 lbs. 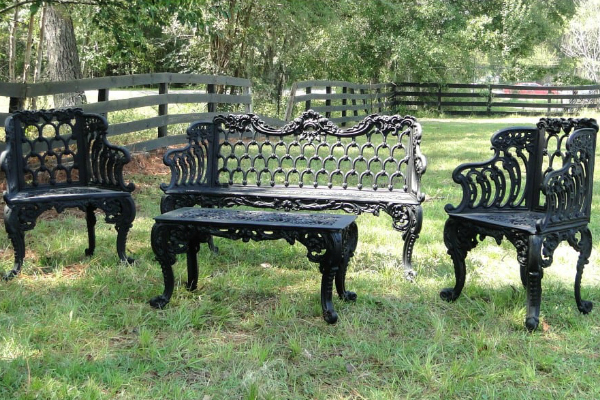 This is the perfect bench to stand out or perhaps even hide away among the trees and flowers along a walkway. You won’t have to worry about this cute loveseat withstanding the elements! Sealed with a high grade coating, this non-rust reproduction is ready to take abuse. Eye catching details abound with design cues from traditional Victorian architecture and decor. At just 42”, this seat is also ideal for an entryway, formal foyer, or on a front or back porch. Once you have a place to sit, make sure you check out our other outdoor decor offerings. From lanterns and sconces to sculptures and dinosaurs (yes dinosaurs!) we have something for everyone.